47. 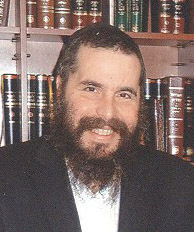 Rabbi Moshe Moskovitz, a native of Caracas, has served the Kharkiv Jewish population for more than 20 years. He is highly respected in the city and beyond. In addition to the education programs cited earlier in this report, the Chabad community under his direction in Kharkiv owns and operates its own summer camp for children and also maintains a significant food assistance program for Jewish elderly. Tension in the city provoked by Russian actions against Ukraine is substantial, said Rabbi Moskovitz. Additionally, the crisis itself generates economic instability and fear of antisemitism. Local people, he continued, believe that the demonstrations in Maidan were good for Ukraine, but, just the same, they fear the potential for increased antisemitism from Bandera groups supporting the Maidan protests. Some individuals in eastern Ukraine, he continued, associate more closely with Russia and Russian culture than with Ukraine and Ukrainian culture, but they do not want to live under Russian occupation. As chief rabbi of Kharkiv, said Rabbi Moskovitz, he must recognize that different people in the city have different opinions on the situation and, accordingly, it is best that he refrain from expressing strong opinions of his own. He must be "rabbi of all of the [local] Jews," he stated. Rabbi Moskovitz continued that the diversity of views in Kharkiv on the Russia issue reflects the proximity of the city to Russia, whereas people in Dnipropetrovsk, which shares no border with Russia, speak with one voice in favor of a strong, sovereign Ukraine with little Russian influence. Russian authority finds a greater presence in Donetsk, where proximity to Russia also is an issue. Rabbi Moshe Moskovitz and his wife Miriam are a major Jewish presence in Kharkiv. Weekends in Kharkiv are tense, said Rabbi Moskovitz, because Russian "visitors" occupy the main square of the city on Friday nights, Saturdays, and Sundays. They deliberately engage in provocative behavior, disparaging Ukraine and glorifying Russia. However, Rabbi Moskovitz stated, Chabad successfully mounted a large Purim celebration in a public space, attracting 2,000 people. As a precaution, Chabad hired additional security personnel to protect people at the event, but nothing unpleasant happened. Vladimir Putin's assertions that Russian actions in Ukraine save Ukrainian Jews from antisemitism are a "sour joke," commented Rabbi Moskovitz. The entire Jewish issue has been "blown out of proportion," Rabbi Moskovitz continued, both by those who allege that Jews planned and controlled the Maidan protests and by those who see antisemites lurking everywhere. Russia and its neighbors have long been "lands of conspiracy," he mused; people look for plots and schemes everywhere. Putin recognizes Jewish sensitivity to antisemitism and attempts to exploit it. The economy, which was weak before the crisis with Russia erupted, has deteriorated further since the Russian intervention, stated Rabbi Moskovitz. Almost all of his major donors have suffered significant losses and, consequently, Chabad has lost about 50 percent of its local funding. He is worried about maintaining the day school, bus transportation to/from the school, the summer camp, and other key programs, Rabbi Moskovitz stated. Other than the Jewish Agency for Israel, which contributed $3,000 for institutional security, no foreigners have responded to the current crisis, declared Rabbi Moskovitz. It is likely that current political/economic conditions in Kharkiv will generate increased aliyah, Rabbi Moskovitz said. In the long term, these departures will reduce enrollment in the Jewish day school, he commented; however, in the short term, family plans to emigrate to Israel may lead to increased enrollment as parents may want their children to learn Hebrew before they move to the Jewish state. The MASA program in Israel is excellent for young adults who want to go to Israel, Rabbi Moskovitz said. MASA will expand and should expand, he continued, because it provides young people with great possibilities for building new lives in Israel. 48. Rabbi Levi Raices (see page 68) operates a prison chaplaincy program, visiting Jews incarcerated in local prisons, especially during Jewish holiday periods. However, stated Rabbi Raices, current conditions in the city sometimes limit access to prisons and, thus, the prison visitation program is now less robust than it had been in previous years. 49. The Jewish Agency for Israel maintains its eastern Ukraine head office in Dnipropetrovsk. One of the two Israel shlichim (emissaries) posted in that city visits Kharkiv every month, sometimes remaining in the city for almost a week. The writer was unable to visit a small JAFI office in Kharkiv, which is staffed by local coordinators who operate several Jewish identity and aliyah-related programs. The Jewish Agency holds aliyah seminars and fairs in the city, recruits young people for Taglit and MASA, offers youth programs and Hebrew ulpan classes, and assists aliyah candidates in making arrangements for their move to Israel and enrollment in Israel absorption programs. This assistance sometimes entails sophisticated placement services for highly trained scientists from a Kharkiv academic or scientific institute. 50. The writer also was unable to visit the Kharkiv regional office of the American Jewish Joint Distribution Committee. 51. The Government of Israel maintains a Consulate and Israel Cultural Center in Kharkiv. 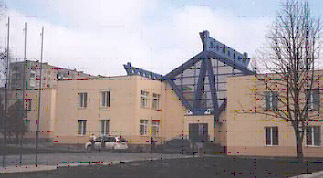 The Consulate serves three major functions: (a) it checks eligibility for aliyah to Israel and issues visas to qualified candidates; (b) it promotes aliyah through various programs; and (3) it represents the State of Israel in Kharkiv, the second largest city in Ukraine and an important academic and technology center in the country. Kharkiv is considered by some to be an unofficial capital of eastern Ukraine and is host to a number of foreign consulates. The number of people inquiring about their eligibility for aliyah has increased significantly since the crisis with Russia began, said an official of the Consulate. Not all of those who are eligible for aliyah will go to Israel, said the official, but local conditions are such that people want to be certain of their eligibility and the processes involved in leaving Ukraine and resettling in Israel so that they can leave quickly if the need arises. In response to this increased interest in aliyah, the Cultural Center has boosted the number of Hebrew ulpan classes that it offers. Among students and young people in general, continued the official, great interest is expressed in various higher education programs in Israel. However, some applicants overstate their experience and accomplishments, falling short of requirements for graduate degree programs that they wish to enter. The Consulate expends considerable energy in checking academic and other backgrounds. In general, the official continued, people in Kharkiv feel insecure and some are leaving the city and country quietly. However, reluctance to emigrate also is evident, even among those who are apprehensive about remaining, because at least they have jobs here in Kharkiv, they have apartments, and they speak the local language. They are uncertain that they will ever find suitable employment or acceptable housing in another country. The likelihood of mastering another language often seems very slim. Although the Ukrainian government strongly encourages the Ukrainianization of all Ukrainian place names, the Russian name of Krivoi Rog has continued to be more commonly used than is Krivyy Rih, the Ukrainian equivalent. The city was founded in the 17th century as a Cossack village, but expanded rapidly in the late 19th century following discovery and exploitation of high-grade iron ore deposits in the area. Krivoi Rog stretches some 130 kilometers (81 miles) in length, connecting numerous mining sites, some of them now inactive. Production of iron and steel, chemicals, and engineering equipment dominate its economic base. Krivoi Rog is located approx-imately 136 kilometers southwest of Dnipropetrovsk. Its general population in 2013 was estimated to be 656,500. 52. The Jewish population of the city is estimated by local Jews to be between 7,000 and 10,000. The extreme linear nature of Krivoi Rog has impeded development of a sense of community among local Jews. 53. The Ohr Avner Chabad day school enrolled 88 youngsters in 2012-2013, a number that endangered national funding as the Ukrainian government now mandates a minimum of 16 youngsters per class to secure state support at the elementary school level. Fearful of losing desperately needed funding, Chabad Rabbi Liron Edri opened enrollment to non-Jewish students for the 2013-2014 academic year. About one-third of the pupils have no Jewish lineage at all, he said. They are attracted to the school because it offers high-quality education and is housed in com-fortable, modern premises, Rabbi Edri stated. The day school campus consists of two large modern buildings and exten-sive outdoor playing fields. The main building is seen at right. A second structure behind the first building includes a preschool enrolling 37 youngsters and a spacious modern sports hall. The design of both structures includes large empty spaces that remain dark much of the time in an effort to save money on electricity costs. 54. A Museum of Jewish Culture and History of the Holocaust occupies one room on the second floor of the synagogue building. In a relatively small space, local historians have arranged an exhibit of Jewish artifacts and other descriptive materials explaining the history of Jews in the region and the fate of local Jews during the Holocaust. Trained docents guide visitors, including school groups, through the displays. 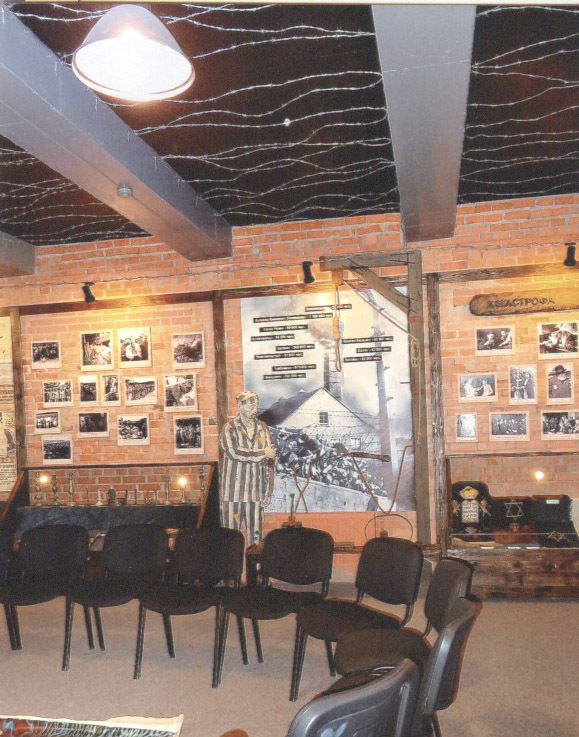 This section of the one-room museum provides informa-tion on the Holocaust in the Krivoi Rog area and generally. Other walls and display cases depict other aspects of local Jewish history and records and artifacts of local Jewish World War II veterans. Mikhail Marmer, a local man, has been a major contributor to the Museum. Grants also have been received from the American Jewish Joint Distribution Committee and the Conference on Jewish Material Claims against Germany. 55. The Joint Distribution Committee maintains a small Jewish community center program within the building housing the local hesed or welfare center. (See below.) JCC activity focuses on ballet classes and a modest sports program. Other than a small Jewish library, the JCC includes little Jewish content. In order to receive an immigration visa, applicants must have at least one Jewish grandparent or be a first-degree relative of a Jewish person. Unlike Jewish Agency ulpans, Israel Culture Center ulpans are free of charge. However, they do not include Jewish-identity building components, a key element of JAFI ulpans.